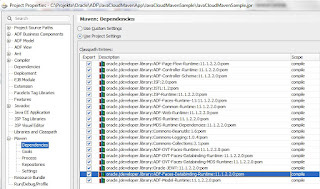 "Free cloud instance for ADF like apex.oracle.com which is available for APEX". As a good sleep at night is one of important aspects of life in order to be able to deal with challenges during a day, this blog post is aimed to make small step towards ADF Live samples and increase an average level of happiness in the community around the framework. 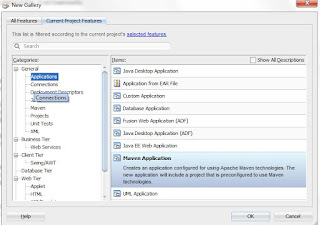 The sample application of this blog post is kind of "Hello World" for ADF and Bounded Task Flow, so the main focus is on using JDeveloper Maven integration (available since R2) to create, package and run it. The sample leverages a subset of the framework: ADF Faces components (view) and Task Flows (controller). As the cloud platform in this case is actually based on Tomcat 6, so the steps used to get it running on Cloud Bees java platform could be useful in case someone wants to run it on a Tomcat locally. Important aspect: the platform is not certified and supported to run ADF, so please don't expect to much, especially to get a complete ADF stack up and running on it without efforts. Oracle Public Cloud was announced (again) last week - if you are in a position of having an account, so there shouldn't be a challenge to deploy and run full ADF application stack on it - as stated here it is ready to run ADF stack. Being not in the position yet i proceed with description of my sample. 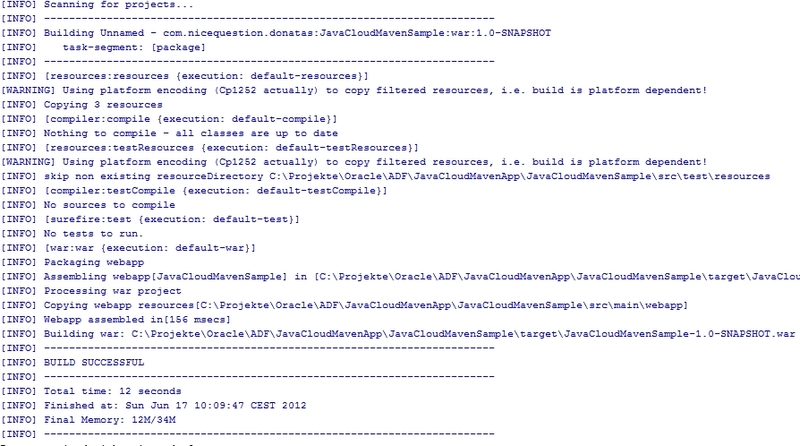 Actually, if you see something like "ADF Task flow running..." in the area above this text - it is the sample application running in java cloud. UPDATE: Recent power failure and associated infrastructure failures in Amazon US-EAST-1 impacted several high profile services and also this ADF sample application - the application was restarted again. There is one page home.jsf with one bounded Task Flow named sample-task-flow, embedded as a region on it. Application scoped managed bean CounterBean.java is used to provide "rich" functionality of the sample: to display start date, and to count page views of two page fragments in a bounded task flow. Lets go trough the steps used to create, package and deploy it. Finish. JDeveloper creates maven project structure for us together with pom.xml. 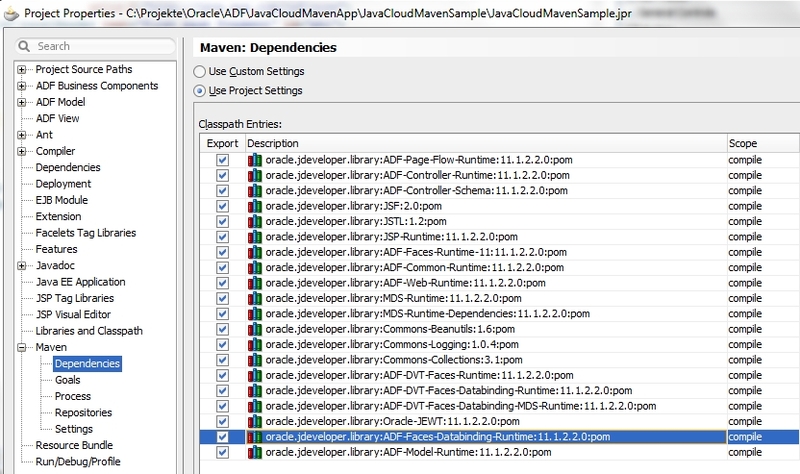 Note: Once you create a Maven application and project, JDeveloper also takes care about keeping Libraries and Classpath in Project Properties and dependencies in pom.xml in sync - very nice and helpful. Our project is quite new at this stage - there are no dependencies at the beginning. It saves some manual fixing later, because once we start to use some specific features of ADF, its metadata, like page definitions, is going to be generated here. 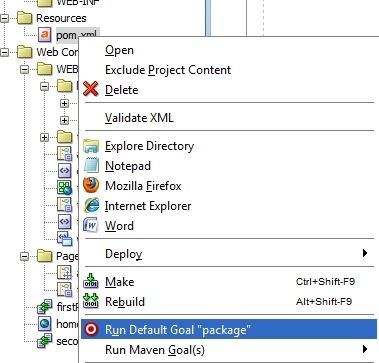 Otherwise we get ADF metadata created outside default resource path. Create ADF bounded Task-Flow in JDeveloper following default settings all the way: New->JSF/Facelets: ADF TaskFlow: ok. Task flow named task-flow-definition.xml is created. JSF page, named home.jsf, was created after that and the task flow was dropped as Region on it . Java class CounterBean.java was created, JSF2 annotations @ManagedBean and @ApplicationScoped were used to put it into the scope of this sample. ADF panelLabelAndMessage and outputText components were used on UI pages of it. The picture of our sample Project in JDeveloper provides an overview of the sample. The same libraries and dependencies are in the list. You might already guessed - there should be something more. Of course. Tomcat based java cloud platform is not certified - some manual "tweaks" are necessary to get the sample up and running on it. The sample project contains one CloudBees platform specific deployment descriptor: WEB-INF\cloudbees-web.xml. The descriptor provides a name (or application id) of bees application created for this sample- in this case <appid>mavenproj</appid>. Trinidad jars trinidad-api.jar and trinidad-impl.jar were copied manually from JDeveloper library locations into application directory WEB-INF\libs to overcome some lib compatibility issue. 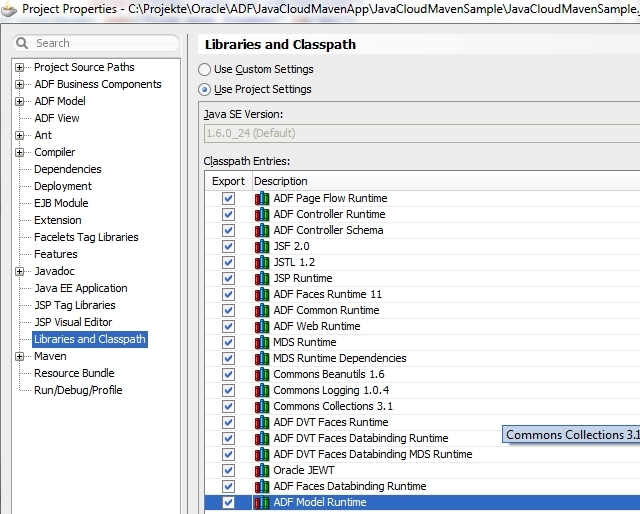 That's all - the section how to create ADF sample app for java cloud in 5 minutes is finished. Our application is ready - its time to test and deploy it. GettingStarted provides few ways how deploy java application to the platform (called RUN@Cloud). One of them is to download SDK and use CLI (command line interface) tool. Note: the CLI is normally cloud service vendor specific - for this platform the command line utility is called bees. Once SDK is downloaded and configured - it can be used to create and deploy applications on the platform. 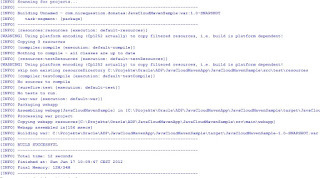 Note: one error message (besides some other messages) is displayed: oracle.jrf.UnknownPlatformException: JRF is unable to determine the current application server platform. It is ok - the platform is not certified, oracle JRF doesn't know it and the Exception states exactly this. Following description in this blog post we created a simple ADF Application leveraging View (ADF Faces) and Controller (Task Flows) part of the stack. 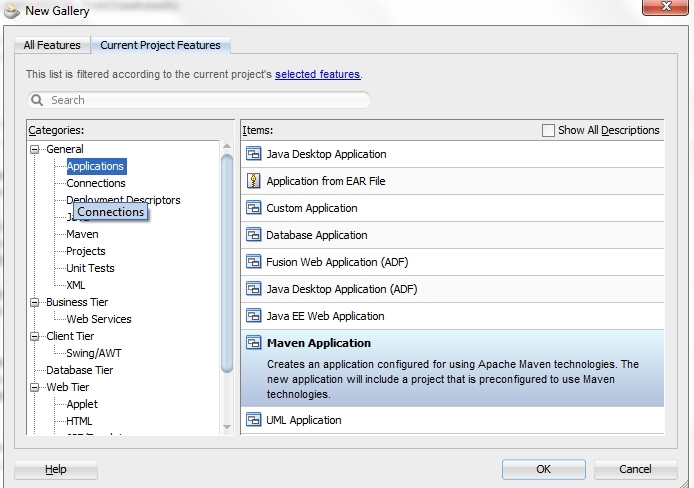 We used JDeveloper Maven integration to set up Maven project structure and to package it. 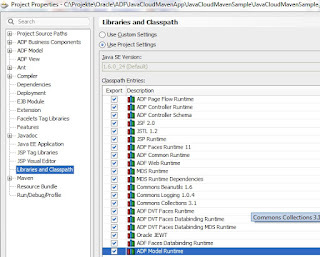 And finally we followed the principle of java "write once - run everywhere" and got our ADF application (ADF is java standards based framework facilitating an easy usage of it declarative way) running "everywhere" - locally and in a public java cloud. The sources of this sample are available at github.